Hi I’m Diane and I’m so excited to have joined the Citrus Twist Kits Pocket Life design team! 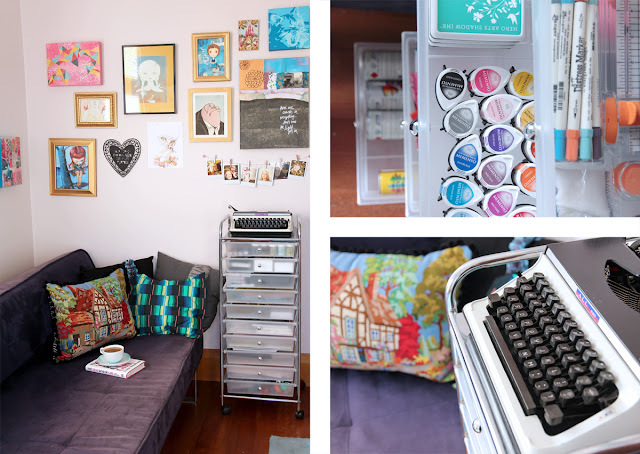 Today I wanted to give you a quick tour of my studio. I got really lucky when we bought our house because there was an extra room that I could immediately paint pink and use for all my crafting (and supplies)! I’m a little bit of a neat-freak so I try to keep this room as tidy as possible. 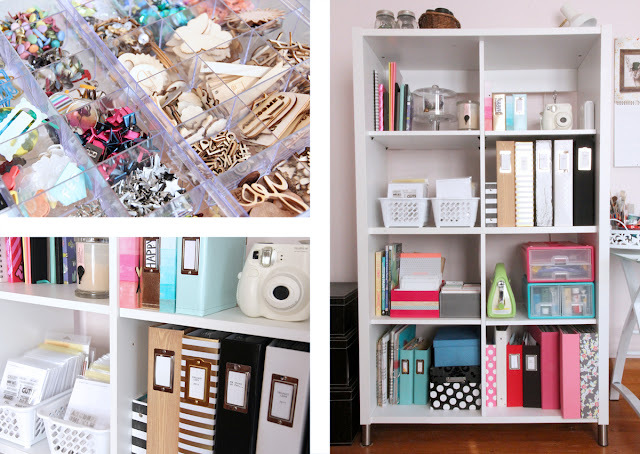 I love the feeling of putting everything away in its place after a crafting marathon. That way I have plenty of room to start again next time! On one side of my room is my desk set up, which is where I do most of my creating, but it also has my computer for work and, more importantly, Pinterest browsing. The shelving unit on the left holds all my albums, cameras and lens, stamps, books, dies, paper, journalling cards, my Cuttlebug, paint, ink and various knick-knacks. The other side of the room has a comfy couch which is perfect for a bit of reading and a coffee (as well as being a handy place for storing all my kits that are waiting to be used!) This side also has a set of drawers that hold all my inks, paints, pens, letterpress supplies, Silhouette mats and blades, card stock, pattern papers, paper trimmer and the bottom drawer has become a home for everything else that doesn’t fall into any of those categories! On top of the drawers I keep my typewriter which I love to use for journalling since I don’t have the tidiest handwriting. 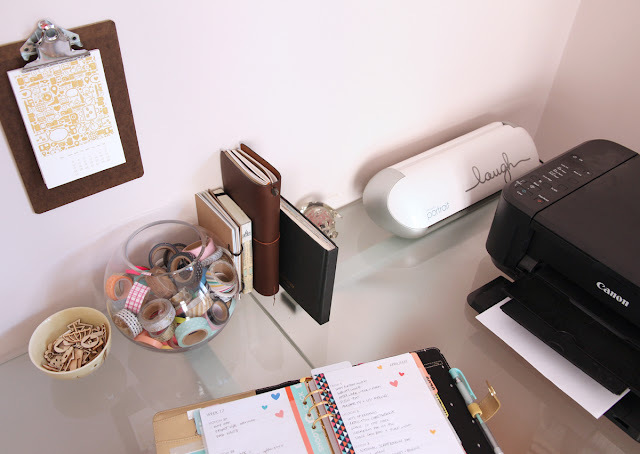 On my desk you can always find my planners, sketchbook, any mini books I’m currently working on, my printer and Silhouette, a bowl of wood veneer and my large fishbowl of wash tape. And usually a few empty coffee cups – but I tidied those away for these photos! I keep all my smaller embellishments, flair, veneer, brads and sequins in clear, segmented containers so I can always find what I need. All my stamps and dies are stored in labelled Avery Elle pockets in bins on my shelf so they are always handy and I can quickly flip through them to find what I need. I tend to use what I can see the most, so I try to keep as many supplies out and visible as possible. The large tray on my desk holds all my essential tools – corner rounder, Tiny Attacher, pens, scissors, tags, brushes, adhesives. I found that since I made a permanent place to set up my sewing machine, I use it so much more because I’ve eliminated the hassle of pulling it out every time. 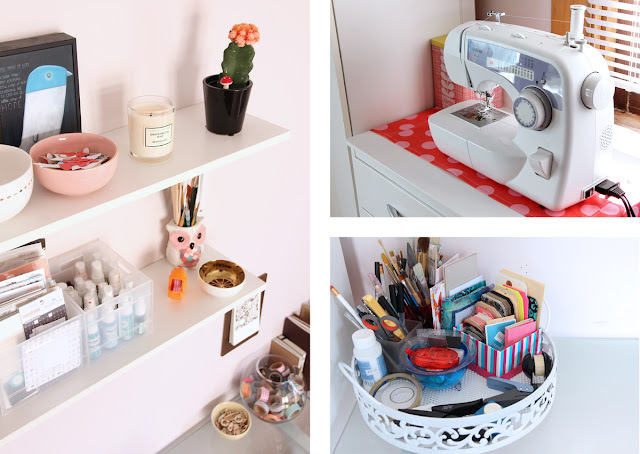 I use the shelves above my desk to store smaller packets of embellishments and stickers, mists, die cuts and my latest favourite scented candle (Grapefruit and Mint – yum!). This is the room I send the most amount of time in and it is constantly evolving but I love it to bits! I hope you’ve enjoyed seeing a peek into my space. Where did you find the bookcase? Looking for something big enough for the 12x12 albums. I got the bookcase about 10 years ago at a store called Freedom Furniture in New Zealand. Luckily the shelves are adjustable so I was able to make the larger albums fit. Thanks Suse, glad you liked it!